There is nothing like holding onto a resentment that can make you feel more alive and self righteous but also drained and stuck. If one wants to be free from the shackles of a resentment, forgiveness must ensue. So many clients that I have worked with talk about how forgiveness is a skill that they have not learned how to use. Here are five ways that you can work towards releasing resentments and onto the path to forgiveness. 1) Forgiveness is for you not them. Most people believe that if they forgive they are letting the other person off the hook and validating how that person wronged them. I can see why most people believe this true. But the truth is when we carry around a resentment it is like a heavy boulder that we constantly lug around with us. When we forgive we are releasing the anger and the hurt that person caused us. We are forgiving the person not the action. By forgiving the person one does not condone or pardon the offending action of the person. Forgiveness allows one to see that that person as being unskilled, imperfect and human. It allows you to stop carrying that person around on your back and you are free of that weight. Remember that forgiveness is a process of mourning and it had layers like an onion. Each time you forgive you release a layer and the more your practice it the more freedom you will experience. 2)When you do not forgive it affects your perception of your life. When we carry resentment with us it begins to taint every experience we have. It makes us believe that the same thing will happen to us again. It makes us internalize that we are bad and we deserve to be punished. When we are constantly in a state of lack or believing that the world is punishing, we create that reality. When we can begin to release all the resentments and begin to forgive we can see ones life with fresh eyes and a sense of possibility. 3) If you forgive you will release old pain. Some people like the way releasing old pain sounds. Some people find this task scary because they believe that their old wounds define who they are. There is fear about who are they then with out these wounds, leaving them feeling lost. If you are having difficulty releasing your old story ask yourself what you are afraid of? If it has to do with not knowing who you are with out this story, try writing about what this story does for you you. Explore your relationship with this identity. Work on having compassion for yourself and realize that you are using this as protection. When you are ready to surrender and release these old pains you can find freedom. Forgiveness has been found to lead to more compassion and understanding for self and others. 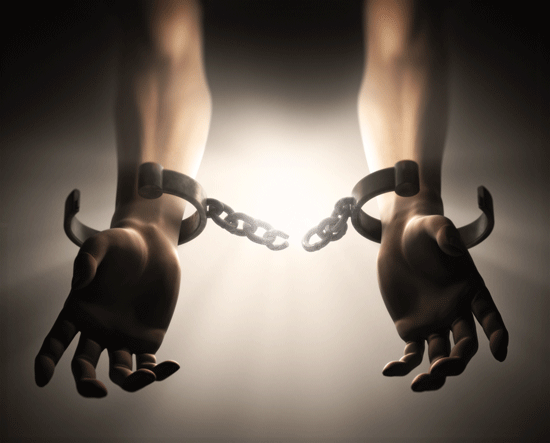 What is stopping you from freeing yourself from these shackles? 4) Forgiveness leads to compassion. The practice of forgiveness leads you to be more compassionate to yourself and others. By first being compassionate to yourself about how learning to forgive and let go is painful. By acknowledging that forgiveness is difficult your are being self compassionate and acknowledging that you are doing your best. When you sit with pain and difficult feelings it allows one to begin to expand your circle of compassion to others. 5) Forgiveness allows you to let go and be free. When we harbor resentments and past hurts it keeps us stuck in neutral. Staying stuck in the same place may feel safe but it is just clipping your wings from flying towards your destiny. Forgiveness allows you to redefine who you are and the possibilities are endless of what you can do. Until this process begins it is very difficult to have new experiences and move forward. By releasing the person and your narrative about how life has wronged you there is possibility for growth and expansion in your life. The process of forgiveness makes you have to face pain and suffering that you have done to yourself and that others have done to you. But if one is willing to do this for themselves, there is possibility to move forward and to live the life that they dream. Here is a mediation from Jack Kornfield to help you with Forgiveness. I hope that you found this article helpful and that you can use some of these suggestions to help you in your process of forgiveness. If you have any comments please leave them below. If you would like to contact me, please feel free to do so here.